My Mum gave me a Mary Berry cookbook At Home which I have used often and love the recipes which I have tried. The only recipe which did not work was the one for Cornish Sticky Cake, it rose very fast and very high and then collapsed. My guess is that there is something wrong with the ingredients probably too much raising agent. I considered fiddling with the recipe to try to fix it but in the end decided to use an old plain loaf cake recipe from Mum’s friend Mrs Campbell. 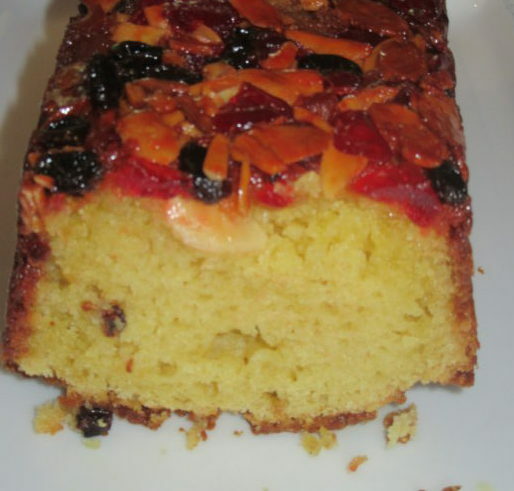 The recipe below is Mary Berry’s fruit topping on Mrs Campbell’s loaf and it’s lovely! Spoon on top of the fruit layer.